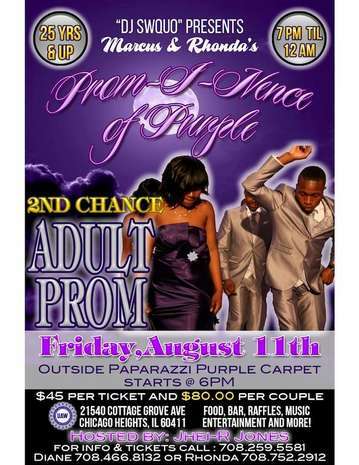 Purple "Prom-I-Nence" 2nd Chance prom is an elegant formal event for the mature and conservative. Our venue details and evening of great music, entertainment, food, and bar! Your host Jhei-R Jones will set the tone for this wonderful and engaging event! Your Host DJ for the evening will be Stepper's DJ RADO TUCK and Special Guest DJ: DJ SWQUO! This is a (Mature) 25 and older event! After 150 tickets are sold, a percentage of proceeds will go to a charity of the customer's choice (Autism Speaks, Breast Cancer Awareness, or chosen organization). So put on your best attire and bring a few friends for a fun and enchanting evening! Thank You for your support!